One of University of Detroit coach Bob Miller's usually reliable hurler Mike Gabriele showed signs of slowing in this April 1989 game, so Miller made some changes, according to The Notre Dame Observer. "Sometimes it (a pitching change) works, if it doesn't, you're a bum," Miller told The Observer. "I've been around long enough to know that Gabriele got a little tired on us, and the other kids came through who hadn't been there as much." Detroit went on to win the game. Gabriele got some rest. He also later turned pro. His pro career, though, ended up being brief, just two seasons. 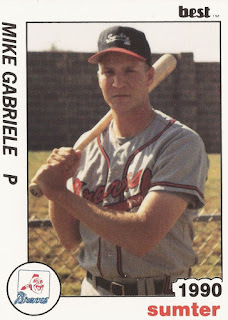 Gabriele's pro career began that June, signed by the Braves as an amateur free agent out of Detroit. Gabriele went to Detroit after graduating from Walled Lake Western High School in Michigan. In 1984, he knocked in the winning run in the state title game with a single. With the Braves, Gabriele started in the rookie Gulf Coast League. In 15 outings, eight starts, Gabriele went 4-2, with a 5.13 ERA. He also saved a game. For 1990, Gabriele moved to single-A Sumter and rookie Idaho Falls. He got 11 relief outings at Sumter, posting an ERA of 8.16. At Idaho Falls, he got into just four games giving up nine earned in 10.1 innings of work. It was Gabriele's final season as a pro.